As undoubtedly one of the top tours from Split, why not enjoy a simply fascinating day trip from Split City to visit Salona, the fortress of Klis and the City of Trogir, Croatia. For lovers of history and archaeology, there is a wealth of medieval and Roman history to be found in the immediate surrounds of Split. On the first stop of the tour from Split, we’ll visit the ancient Roman ruins of Salona, which was the capital of the Roman province of Dalmatia about 2000 years ago, as well as being one of the five biggest towns in the entire Roman empire! Wander the large Roman amphitheatre where early Christians were fed to lions – fit for a City of 60.000 in its peak. Salona is remarkably little visited by tourism which makes it an unsung gem for those wanting a more personal yet fascinating Roman experience. 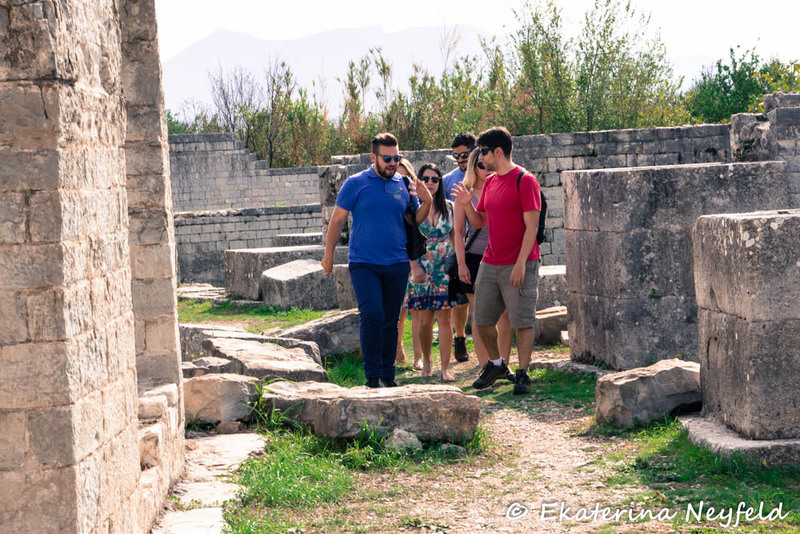 Our local expert guides will make the ancient City of Salona come alive for you. From here the tour will travel to the village of Klis, which is home to an imposing medieval fortress, perched high on a hilltop above Split. This fortress became seat to many Croatian kings and served as a defence of Split against the Ottoman invasion during the early 16th century. More latterly, it has featured in the blockbuster television series “Game of Thrones”. Next, we head to Trogir, Croatia, a city which has had 2300 years of cultural and architectural influence by Greeks, Romans, Venetians and Austrians. In 1997, Trogir City was recognised as a UNESCO world heritage site. Following our guided tour of Trogir, you will have an opportunity to stop for something to eat during your free time – the choice of restaurants in Trogir is great! This tours generally leaves from our Split office at 9am and returns about 5.30pm. We stop at Salona for about 1.5 hrs, at Klis fortress for about in 1.5 hrs and in Trogir for about 2 – 2.5 hrs though times vary depending on the specific wants of the group. Our guide is at your disposal throughout. The views are stunning and for GOT fans – it’s a must! A fascinating trip of the ruins of the Roman City of Salona followed by a visit to Klis fortress and the UNESCO City of Trogir. All our tours are small group and fully guided.